… and my Raspberry pi2’s kill count now stands at 3 SD cards. Recovery is not a problem since it’s backed up regularly, but it’s an irritating issue; whilst I don’t expect massive endurance from any of these cards, I expect them to last longer than they have as the system isn’t write heavy. The symptoms so far are never the same; card 1 simply became read-only, card 2 started exhibiting silent file corruption fixable by re-writing the data, and now the issue with card 3 manifests itself as the server randomly hanging whenever the system hits a particular portion of the card. Card 1 was class 6 and branded “Maxell”, card 2 was class 10/U1 and branded “Kingston” and card 3 a “Toshiba” class10/U1. You can pull some information about the cards controller from the command line, however it would seem that without dissolving off the cards cases in nitric acid it’s hard to really know what you’ve got. The underlying issue could be anything; firmware, power or pi2 design, but because the failures are always different I think this is purely down to card quality and wear out. Historically this server was hosted on a Cobalt Qube2 with an 8gb flash card, and then on a Raspberry pi model B with a 16GB SD card; both for long periods of time without issue. Both cards were also branded “SanDisk”; although I’ve no idea if that really makes any difference. This time I’ve brought the site back up on the Raspberry pi model B, mainly because I’d not got a suitable working micro SD card for the pi2. We’ll see how it goes, but it might be time to move some things to tmpfs! 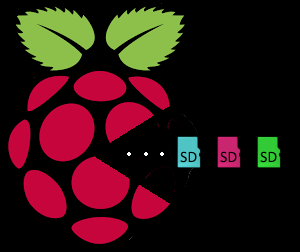 This entry was posted in Raspberry pi, Storage and tagged failure, raspberry pi, SD card on June 2, 2017 by Glyn Astill. This has something to do with the scsiId, which is required by the cluster manager to control volume ownership, being supplied by iscsitarget in a format unsupported by WSFC. I failed to find a workaround for this and instead switched to using “tgt” to serve the iSCSI targets. I was pushed for time, and couldn’t find a straightforward guide so I’m documenting my steps here. 6) Restart to ensure the configuration is picked up. This entry was posted in Debian, SQL Server and tagged AlwaysOn Failover Clusters, Debian, iSCSI, iscsitarget, SCSI page 83h VPD descriptor, SQL Server, tgt, WSFC on February 24, 2017 by Glyn Astill.